To study the population growth of an organism at a particular area. To study factors affecting the population growth. Population growth refers the all organisms belonging to the same species living in the same area at the same time. This growth is controlled by the rate at which new individuals are added to the population through the process of birth and immigration and the rate at which individuals leave the population through the process of death or emigration. The population in which immigration or emigration occur is known as open populations. Those in which movement into and out of the population does not occur is referred to as closed populations. Birth rate is the rate at which new individuals are added to a particular population by reproduction. It is generally expressed as number of births per 1000 individuals of a population per year. Birth rates are affected by factors such as nutrition, fertility, attitudes about abortion, labour value of children, government policies, social value, the availability of contraception and culture. The theoretical maximum production of new individuals under ideal conditions is known as “Absolute” or “Physiological or maximum natality”. The “Actual birth rate” under existing conditions much lesser than “absolute natality” is called realized natality. The population density and population size increases at higher realized natality rate. Death rate is the rate at which the individuals die or get killed. It is the opposite of natality rate. Death rate is generally expressed as number of deaths per 1000 individuals of a population per year. Death rate is affected by disease war medical technology, improved health care, transportation development and nutrition. The lowest death rate for a given species under most favourable conditions is called potential mortality. The actual death rate is observed under existing conditions is called realized mortality. The realized mortality decreases with population size and population density. The percentage ratio of birth rate per death rate expressed in percentage is called Vital Index. It determines the normal rate of growth of a population. Immigration is the number of individuals in a species moving from its local area to other area. Emigration is the permanent movement or departure of individuals of same species out of the location due to lack of food, scarcity of space (overcrowding) etc. Due to emigration, species spread into new areas which results the decreasing of local population. If the number of individuals added is greater than lost, the population will show positive growth. The population show negative growth when the added individual is lesser than lost. If the added and lost individuals are equal, the population will become stationary and is called zero growth. The density of population can alter by the influence of abiotic factors such as temperature, wind, humidity, rainfall, intensity of light. The population density can also affected by the biotic factors like organisms of other species living in the same area with different types of food relationships. Different populations have different capacity to tolerate changes in weather, physico-chemical and biotic factors. This is called resilence. Exponential and logistic growths are the two simplest models which explain about changes in population size. Both models assume that the environment is constant but they differ in what they assume about the availability of resources (e.g. : food, nesting sites, water etc). Exponential growth is also called as Malthusian model because Malthus was first realized that any species can potentially increase in numbers according to a geometric series. Exponential growth occurs in relation with the population increases by a certain factor with respect to the successive time period. It occurs when a single species is not limited by the other species, the resources are not limited and the environment is constant. The population of organisms will grow exponentially with the unlimited resources. This will happens only when there is no other disturbance against the individual’s ability to access whatever resources it needs. Where dN/ dt is the slope of the exponential growth curve, N is the population density and r is the per capita growth rate. The graphical representation of the exponential growth will give a J shaped curve. The exponential growth is constant which means the population grows by adding more number of individuals to the breeding pool. Therefore, as the time increases, the curve moves upwards at a faster rate. J curve is the characteristics of species introduced into a new environment or rebounding after dramatic population reduction. In every spring season algal blooms are appeared on the water surface due to the mixing of water in a pond or lake. The water acquired a fairly uniform temperature due to the melting of ice. This allows nutrients in the sediment at the bottom to mix in the water at uniform levels. 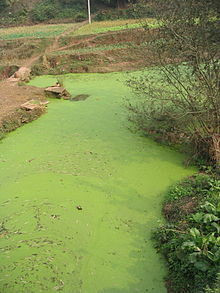 The algae near the surface of water use sunlight and nutrients to grow exponentially and soon the pond’s surface became greenish color. During summer season, the sun warms the surface water and creates a strong temperature barrier which does not allow the nutrients from reaching the surface. This causes the decline of algal population until next spring. In this example, the growth curve of Populations give a J-shaped curves and are usually controlled by physical aspects of the environment like weather. The effect of these abiotic factors is independent of the density of the population, this pattern is called density-independent growth. Density-independent growth patterns controlled by abiotic factors such as weather characterize species variously referred to as opportunistic species (because they take advantage of favorable conditions to realize their biotic potential), colonizing species (because they often disperse to new areas when their density is high), or fugitive species (because they cannot persist for long periods in any one area due to competition with more table or equilibrium species). The growth and population of organisms are one of the important dynamical processes in ecology. In all species, the reproduction is imperative for survival. 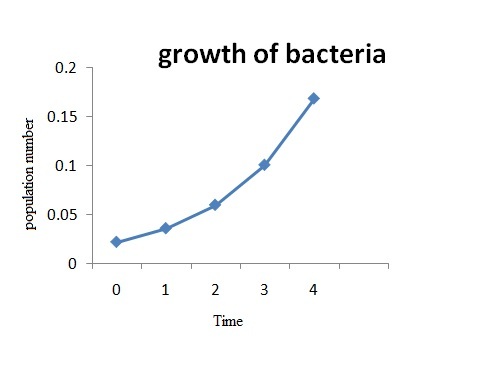 The growth of a bacterial culture is one of the most familiar examples of exponential growth. The study of bacterial growth is the important in biology and medicine. The population growth of bacteria under the controlled laboratory environment is relatively simple. The growth rate is centrally important in any physical and chemical description of a bacterial cell. The growth of bacterial populations increases rapidly when grown at low bacterial densities in nutrient rich environment. In laboratory, the population of bacteria increases due to asexual reproduction known as binary fission where the population doubles at regular intervals. The growth of bacteria increases by geometric progression: 1,2,4,8….. Or 20,21,22,23……2n ( n is the number of generations). The time required for a cell to mature and divide is approximately the same for any two cells. This is called exponential growth. The population growth is monitored over a period of time by constructing a typical bacterial growth curve with plotting the number of bacteria on the Y axis and time on the X axis. The exponential model of bacteria predicts that the population increases at every discrete time interval. Due to this reason, the bacterial population growth can serve as a basis for a simple discrete dynamic system model. Cornette et al. studied the growth model of bacteria using a marine bacterium commonly found in mud around estuaries called Vibrio natriegens. The growth rate of this species can easily manipulate in a laboratory. They grow this bacteria in a nutrient medium in which its pH was adjusted to 6.25. 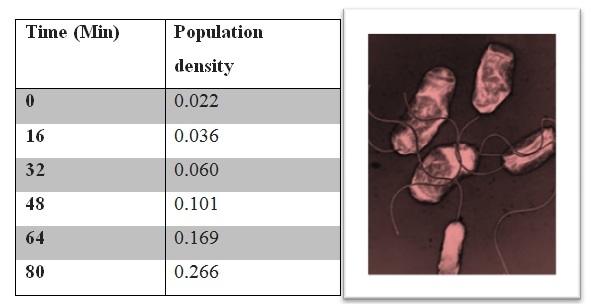 The bacterial population density was measured using spectrophotometer and is shown in the following table. The population dynamics of this can be studied by constructing a graph by plotting population changes as a function of time. From the above plot, the population change increase fastly that give a J shaped curve.